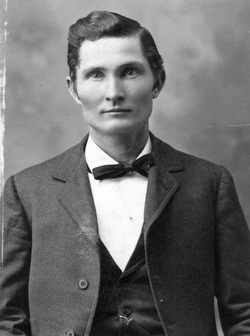 Dr. Robert Lee Davis (1865-1952) was born on November 6, 1865 in Farmersville, Collin County, Texas, a son of John M. Davis and Sarah Roland. He graduated from Farmersville High School about 1882/83, and later traveled to Memphis where he attended and graduated from Memphis Hospital Medical College in 1892. Before heading off to Memphis, he married a longtime friend and neighbor of the Davis family, Lenora Bettie Chapman (1868-1956), daughter of John Newton Chapman and his first wife, Mary Ann Yeary. Their marriage occurred on March 25, 1885. The following day, his younger sister, Clara Davis, married Andrew H. Burns, who was the same age as Robert Lee and probably a friend as well. Their children included Millie O. Davis (1885-1888); Bessie Ethel Davis (1889-1890); Hallie Mabel Davis (1891-1985) who married Zollie Webb Taylor (1884-1980); Walter Allan Davis (1893-1941) who married Ora Mae Dugger (1894-1982); Sam Davis (1896-1936) who married Helene Jessie Fritz (1895-1969); Hassie Lee Davis (born 1898) who married Porter W. Cave; Alta Corrine Davis (1900-1988) who married Sirvillian Stanley Knapp (1897-1969); Margie Kate Davis (1902-1950) who married Leslie Marion Hailey (1905-1988); Dorothy Marie “Dot” Davis (1907-1996) who married Maurice Moore Winzer (1904-1995). Robert Lee Davis began his medical practice in Princeton, Texas, and in 1917 moved to McKinney, Texas, where he practiced for the remainder of his life. He served as President of the Collin County Medical Society in 1948. He died on September 30, 1952, and his wife, Lenora Bettie Chapman, died January 27, 1956 in Dallas, Texas. They are both buried in the Restland Memorial Cemetery in Richardson, Texas.